With Deepavali comes good luck, prosperity happiness and lots and lots of sweets. 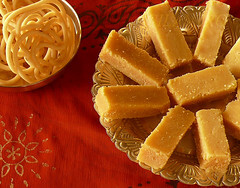 Typically different variety of traditional Indian sweets and snacks are prepared well in advance. One of the sweets I made for this year`s Deepavali is Dry Fruits and Nuts Halwa, which contains a variety of delectable dry fruits and nuts that are sweetened with sugar and flavored with cardamoms. The natural sweetness from the fruits, the crunchy almonds and a little bitterness from the walnuts makes this dessert a divine delight. Wash the almonds 4 to 5 minutes and then soak them for about 4 to 5 hours in warm water or until the skin comes off easily. Peel the skin and keep aside. Soak the walnuts in a cup of water for five minutes. Drain and wash well. Set aside. Chop the nuts finely. Fry the crumbs in about four tablespoons of ghee till well roasted. Transfer to a plate. Chop the dry fruits as much as possible. In a large heavy bottomed pot, add the dry fruits with four cups of water. Stir and cook over moderate heat till the mixture becomes a little thick and the dry fruit is cooked or until it is like a thick gravy consistency. Mix in the sugar and stir well until the sugar is dissolved. Add the crumbs and stir to halwa consistency. Add the remaining ghee and cardamom powder. Serve warm at room temperature. This halwa looks mouth watering.A very rich dessert. Got a nice glossy look! Superb! Holy Cow Look at that delicacy!!! using bread crumbs is new to me, but if anything looks like it, i won't even bother to ask what is in there:-)I will eat it all! Yummy halwa indeed. Great click!! That looks sinful! I am sure going to try this! Bookmarking now :) Lovely colour!! 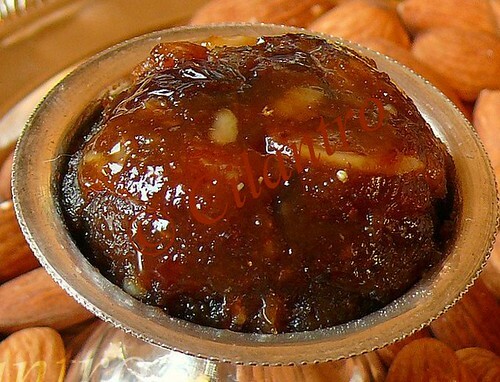 Perfect halwa for Diwali... Looks so mouthwatering. YUM! Looks so delicious!! halwa texture is perfect! Happy Diwali! Oh my, this look so rich and decadent. 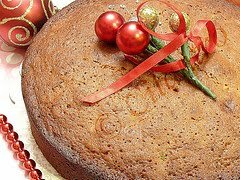 Ohhhh so beautiful and interesting recipe bread crumbs and dry fruits whhhh what a combinationg sounds great. wow, that's a different kind of texture for halwa, but looks appetizing! Halwa has beautiful color and looks so yummy. First time here..nice to discover ur blog..
OMG. This looks heavenly. Am so going to make this when I go home next month. Thanks for the innovative recipe. I made it today for my mil's bday and she was too pleased. I halved the sugar, but did not alter anything else. It came out like Tirunelveli Halwa, thanks again. Would it be good to grind it up after reaching the gravy consistency? Planning to try that next time with 1/4 qty. of the recipe :). The huge bowl of Halwa is too tempting! Thank you for the feedback and I am glad you liked it. Please do try the method you mentioned and let me know how it turns out. why did you use bread crumbs? Adding bread crumbs makes it thicker and gives it a texture. The racipe seems quite easy, I am definitely going to try this. I love dry fruits.